Hanukkah, or the Festival of Lights, is a cultural holiday for those who practice Judaism, though it’s actually considered minor in terms of religion. There exists no restrictions on working or attending school during its eight-day observance — probably because Hanukkah isn’t even mentioned in the Bible. This is why, Fran Adler of the Jewish Federation of Fort Wayne said, it’s a misconception that Hanukkah is “the Jewish Christmas,” especially since the custom of gift giving wasn’t popularized until the twentieth century. Hanukkah, explained Adler, is a holiday celebrated mostly in the home. It began at sundown on December 12. During the eight nights of the Festival of Lights, families may invoke the story of the Hanukkah miracle, of the jar of oil that burned for eight days. The story of the Hanukkah miracle, according to Adler, appeared centuries after the events on which it is based. In 186 BCE, oppressive Greek-Syrian forces desecrated the Temple in Jerusalem. As a result, observing Judaism was outlawed, and followers had two options: conversion or execution. A resistance movement called the Maccabean Revolt formed against the invaders and, though outnumbered, the resistance prevailed and the Temple was reclaimed. Hanukkah means “dedication” and commemorates the rededication of the sacred space. According to the story, when the Maccabees entered the Temple to reclaim it, they immediately relit the ner tamid, or eternal light. However, they found only one jar of oil, just enough to fuel the flame for a single day. They sent a messenger for more oil, and when he returned eight days later, the flame was still burning. “p1″>Each of the nine candles of a menorah, the nine-pronged candelabra so emblematic of Hanukkah, represents a day of miraculous light. 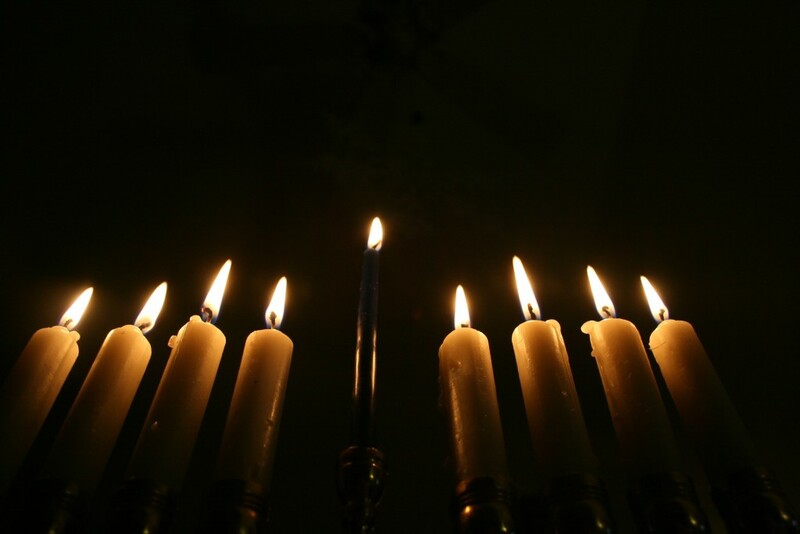 Each evening at sundown, another candle is added to the menorah: one candle the first night, two the second, and so on. A ninth “helper” candle called the shamash is used to light the others. Though small gifts may be given, Hanukkah is a festive time for special foods and games. Traditional dishes of the Festival of Lights are typically fried in oil, an allusion to the miracle. Latkes are pressed, pan-fried cakes make of shredded potato and served with sour cream and applesauce; another favorite are jam-filled doughnuts called sufganiyot.